Local rankings have become more and more important since the Google Venice update from February 2012. These local rank results are now available in SEO Effect rank checker too! You can now check how your site is presented to visitors from Amsterdam, Berlin, London, New York, Stratford upon Avon or Stillwater Minnesota. This is vital if you have a local store or if you have local branches. If you do a search for a local service, Google will try to resolve where you are searching from and serve you results that are relevant to that location. Try words like “day care” “ car wash” or “bakery”. In Google, click on ‘search tools’ to change the city or zip code (depending of the interface in your region, sometimes it’s presented right above the first Google places result). In the screen shot below the results for Manhattan are presented. Before the Venice update only ‘day care Manhattan’ – or any other city – gave local results. 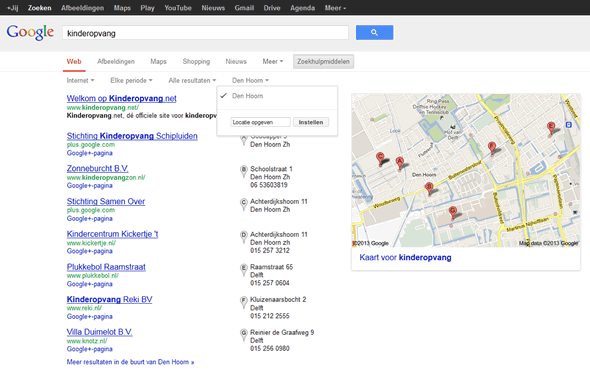 After the Venice update, Google ‘knows’ which keywords need local results. For monitoring local search results, SEO Effect now has the similar capabilities. You can – for Google only though – create search engine profiles for virtually any city or town in almost any country. 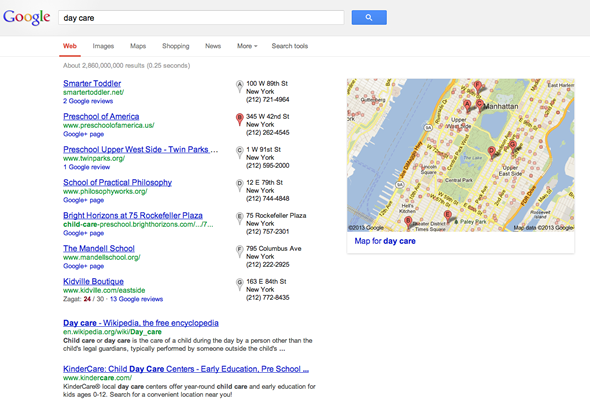 You’ll then start gathering weekly data on how users form those locations see your site in the Google search results. 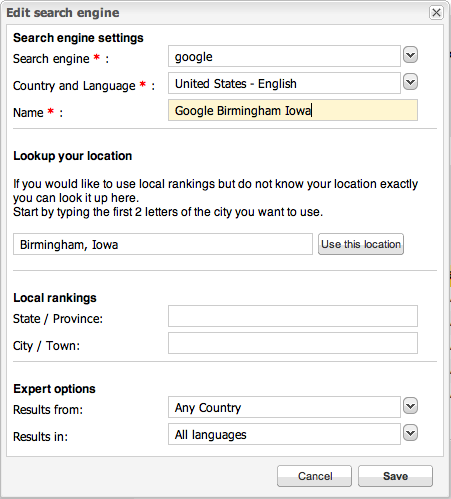 Compare search results in cities where your company does or does not have a local presence. Or – in reverse – see how your nation wide offerings stack up to local competition in areas where your performance is lagging. Monitoring of rise or drops of your rankings in local search results to assess the effect of your local link building efforts, check the link profile of your strongest local competitors to re-use their link strategy (see for example SEO Effect’s ‘local citation’ link prospection method. How to set-up a local search engine profile in SEO Effect? This is done during the creation of a campaign or in an existing campaign via “Campaigns” > “edit”. By default, SEO Effect sets up two profiles (Google and Bing). Click on the “Edit” icon of the search engine profile that you want to alter. You’ll get the screen shown below. Choose “Google” and make sure that country & language and the name are filled in to your likings. Then proceed at “lookup your location” and enter the city or place of town of your choice. You can get multiple suggestions (e.g. ‘Birmingham’ conjures up 17 (!) options in the US and of course the British original). Select the suggestion that fits and click “use this location”. The chosen suggestion is filled in in the appropriate fields.